Watering tips from the pros. When and how much to water is determined by many factors, such as time of year, plant age, water pressure, and soil drainage. In spring and fall, mature plants need approximately 1 inch of water per week. If you area is receiving adequate rainfall to meet these needs, you may have to water very little. In the heat of summer, mature plants may need up to 2 or 3 inches of water per week. In winter, mature plants only need to be watered if your area has gone 4 to 6 weeks without precipitation. New plantings require more frequent and deeper watering than established plants. Watering deeply during the first two years will help your plants grow deep root systems. Mature plants need water less frequently, but for a longer duration to ensure established roots can thrive at greater depths. New plantings should be watered twice a week in spring and fall (1/2 an inch each time) and 4 to 6 times a week in summer (1/2 an inch each time). Mature plants should be watered once a week in spring and fall (1 inch each time) and 2 to 3 times a week in summer (1 inch each time). Winter watering can be consistent for new and mature plants. Convert the inches of water needed (based on the season and age of plant) to the flow of water that comes out of your hose by multiplying the number of inches of water you need by 0.6 gallons. Then multiply the resulting number of gallons per square foot by the square footage of your garden to determine the total number of gallons you need to apply. Finally, determine how long to leave the hose on by timing how long it takes you to fill a 1-gallon bucket with your water hose. Then divide the number of gallons needed by the time needed to fill a 1-gallon bucket. The result is the time needed to provide the necessary inches of water to your entire garden. To calculate soil drainage, run a simple test by digging a 2-foot hole and filing it with water. If the water drains within 2 hours, you have excellent drainage. If the water drains within 8 hours, you have adequate drainage. If the water takes longer than 8 hours to drain, you have very poor drainage. If you have excellent drainage, follow the watering instructions as stated above. If you have adequate drainage, divide watering frequency in half. If you have poor drainage, divide watering frequency by 4. 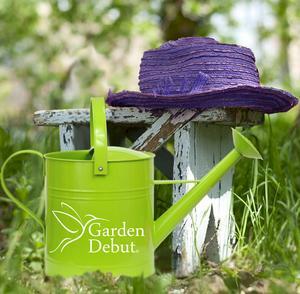 For more tips on caring for your Garden Debut® plants, click here.